Hello children! We are half-way into the month of January already. Hope you are having a great start to the new year. From playing in the snow to enjoying the warmth of the fireplace, you must be relishing the winter season. 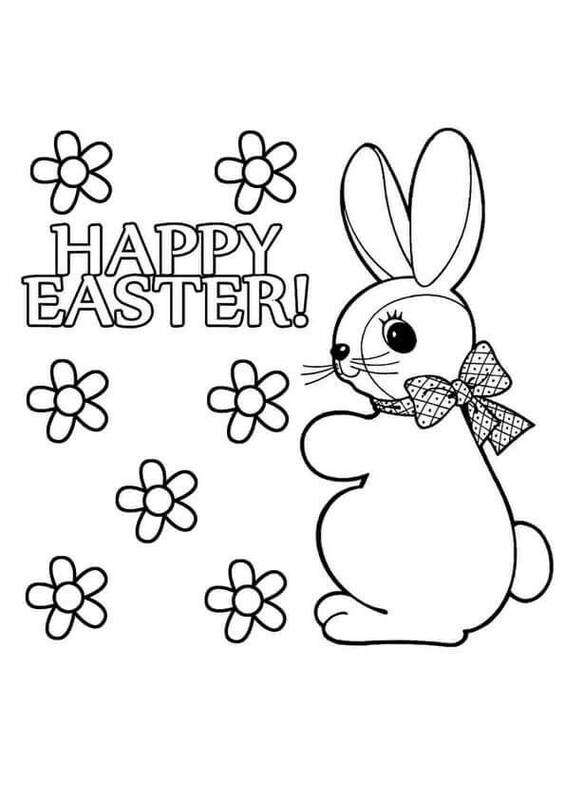 To make your time more enjoyable we have brought an exciting collection of Easter Bunny coloring pages printable. 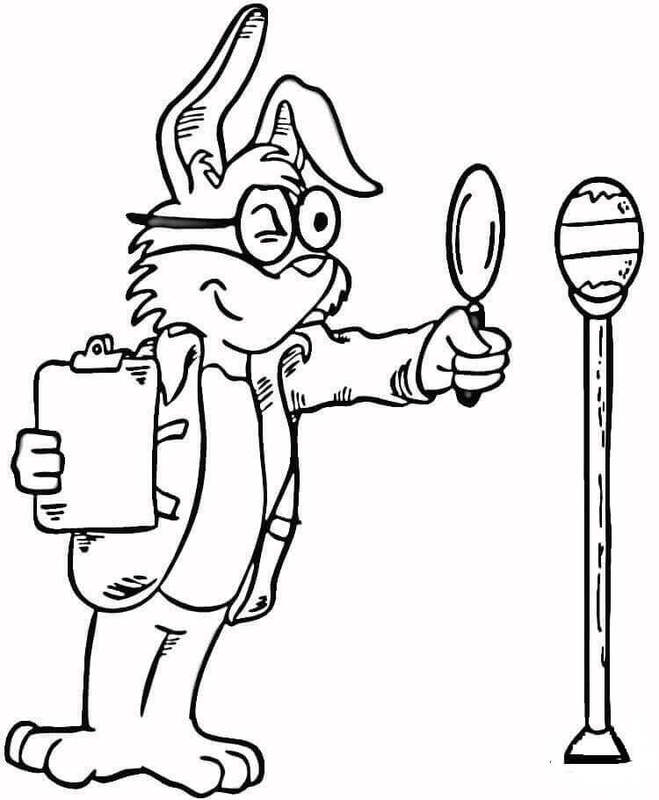 A legendary creature associated with Easter, the Easter Bunny is described as someone who checks if children have been good or bad and delivers them the painted Easter eggs, which are gifted during Easter. 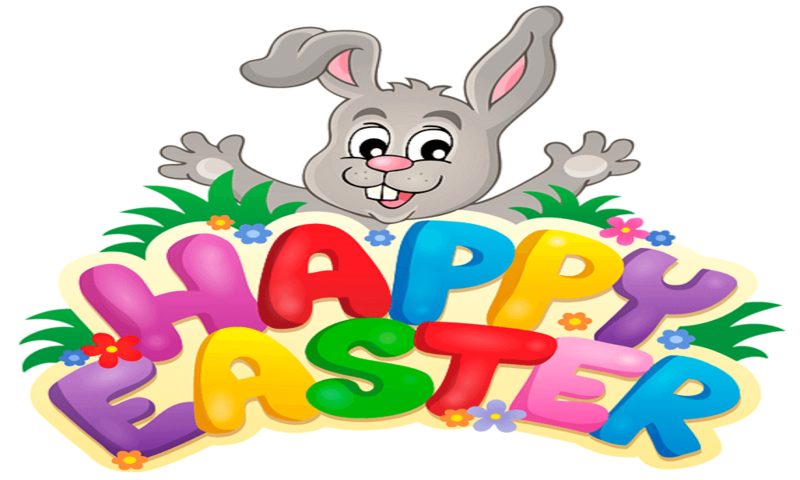 Much like Santa is to Christmas, Easter Bunny is to Easter, a celebration marking the resurrection of Jesus Christ three days after his crucifixion. 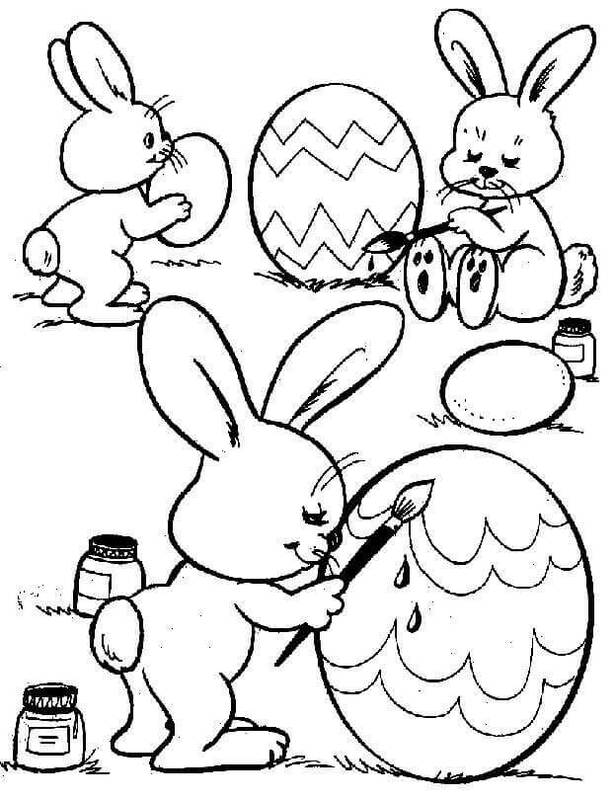 So, let’s look closely at their lives through this collection of Easter Bunny coloring pages to print. After playing around the whole day, the tired little bunny is tucked in by her parent. She gently rocks the cradle as she hums a soothing song to put her to sleep. This must remind you of your parents tucking you in at night. You can clearly see all the special features of this Easter Bunny. From the long earlobes to the fluffy tail, it’s not surprising why this adorable creature is linked to Easter. You can bring out the uniqueness of this creature by printing and coloring this page. When she knew that Easter was coming soon, this enthusiastic bunny got her Easter eggs ready and is now mixing her colors to start painting on them. When you have a task to do, make sure you are as prepared and as efficient as this bunny. What do you do when you are happy? Laugh, smile or even dance. But this talented fellow here is so happy to finish decorating all the Easter eggs that he is juggling them all. Let’s hope he doesn’t drop any of these. 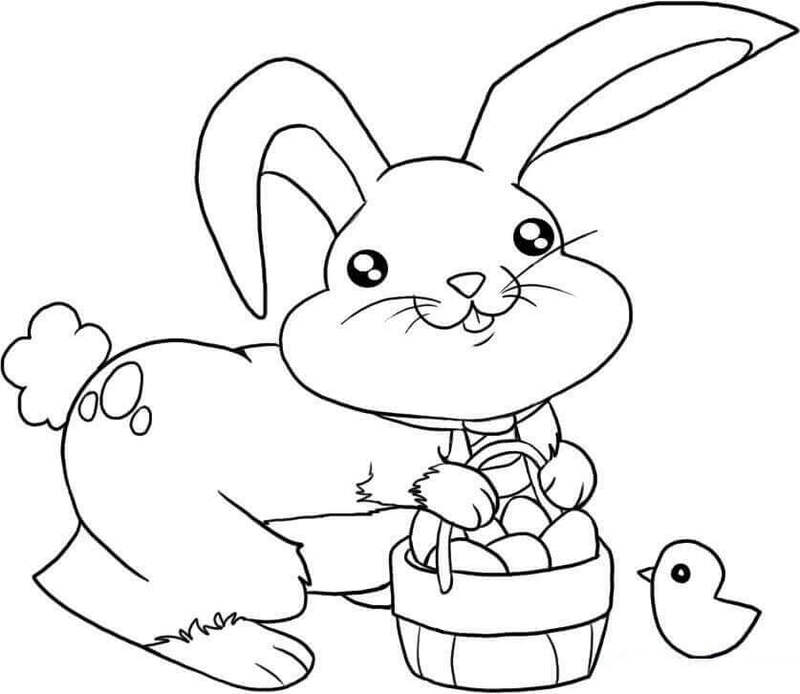 Print this page and start coloring the illustration to cheer him on. 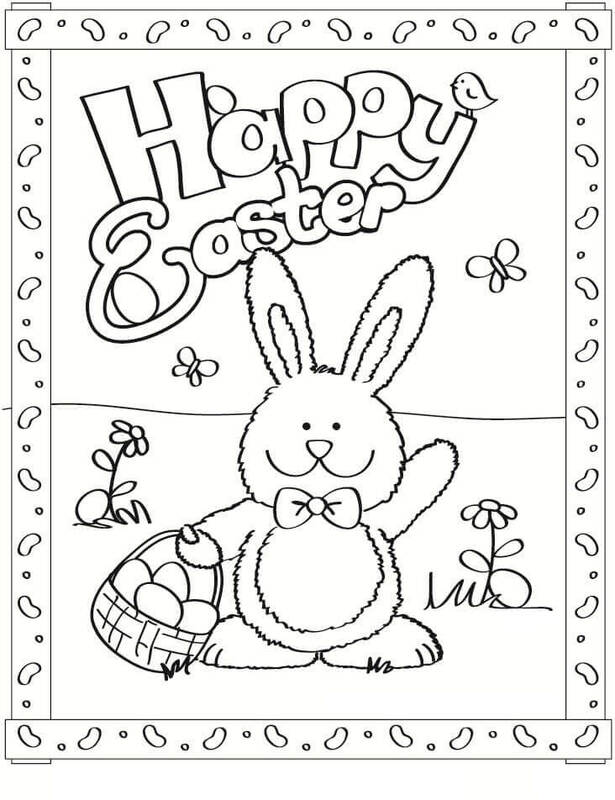 Apart from taking part in all the activities, you can create an Easter greeting card for them, to add your own special touch to the celebrations. 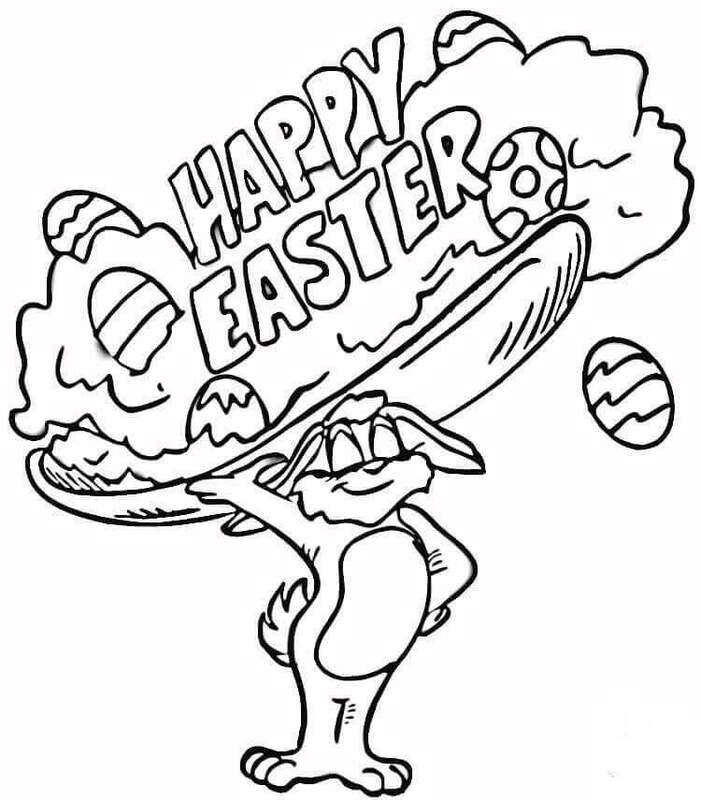 Featuring a cool Easter Bunny, you can print and color this illustration to turn it into an awesome “Happy Easter” card. Having finished collecting his Easter eggs, this lovable Easter Bunny is showing them to this little chick. He will soon start painting these eggs to be prepared for Easter. You can help him with the design and coloring. 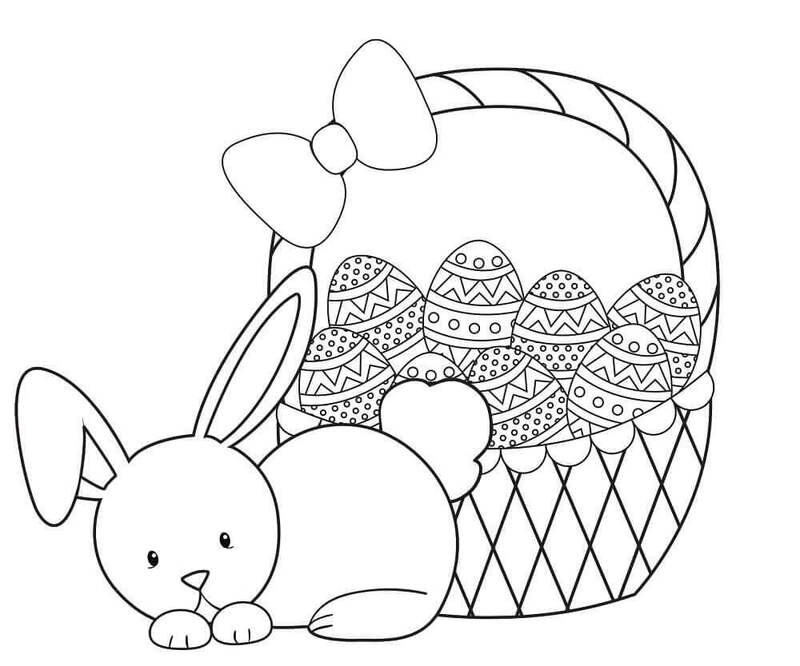 Print this page and color the illustration diligently. Pretty Little Easter Bunny Is Looking Happy! 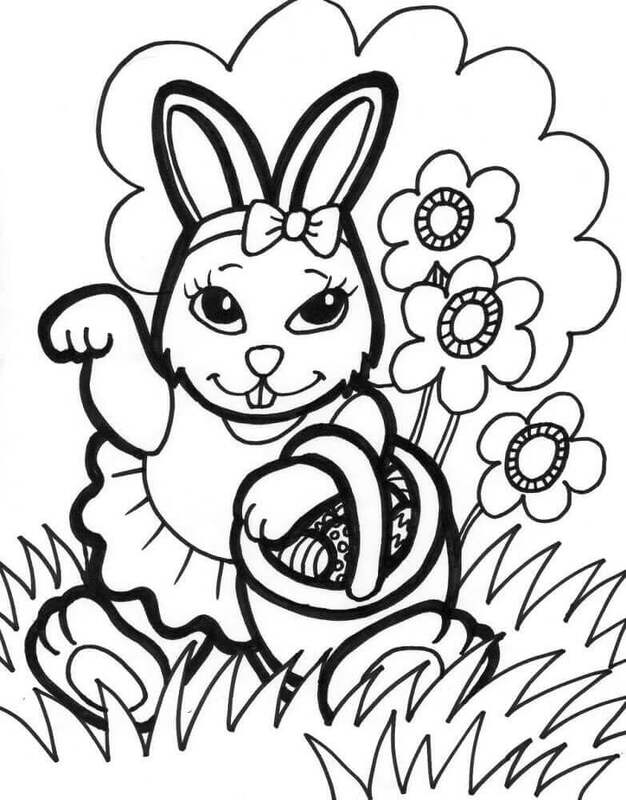 Running around in the flower garden, this cute little Easter Bunny is happy to have filled her Easter egg basket with pretty Easter eggs she had painted and decorated. She is even dressed in her best attire. 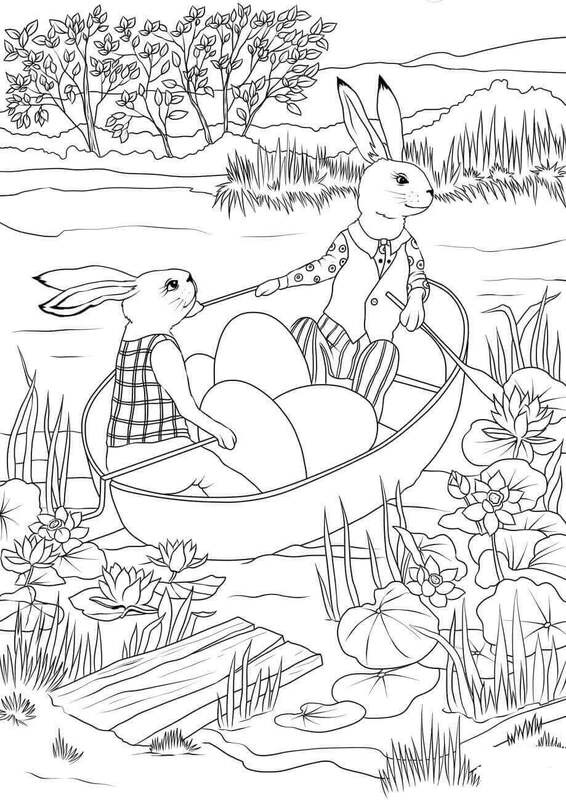 You can fill in all the colorful details in this illustration once you print this coloring page. 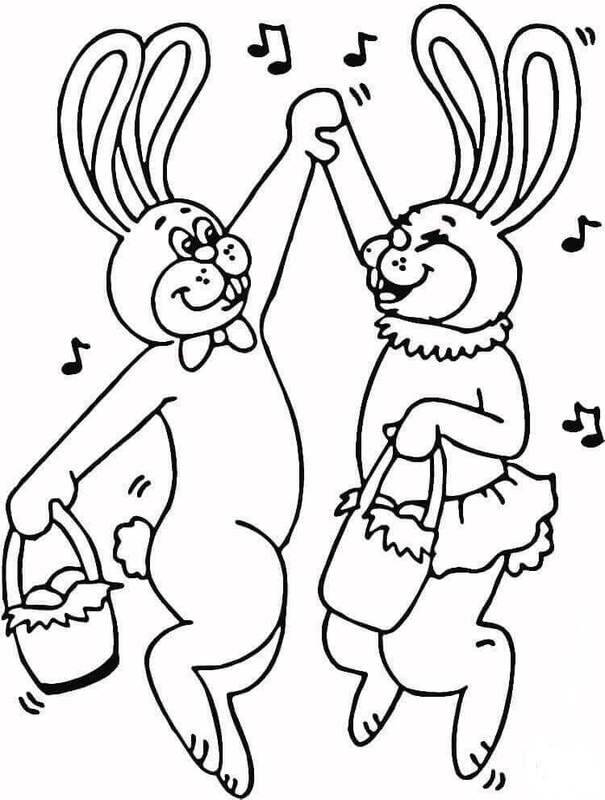 Just like you dance around when you are extremely happy, these two Easter Bunnies are having a great time dancing together. They are happy about having finished decorating all their Easter Eggs. If the Easter Bunnies thinks you have been doing good and you are deserving, then they will march right in and leave all the goodies including the well-decorated Easter eggs for you. The lucky kid in this house is in for a pleasant surprise as they head inside to reward him for being good. Discipline is the key to success. Without your hard work and discipline to do justice to what you are doing, success may not come to you. That’s why these Easter Bunnies are all busy working and painting their Easter eggs to finish right on time for the Easter celebration. You too must always be disciplined in life. You can use your sense of discipline to print and color this page. Knowing that he has a lot of ground to cover trying to paint and decorate this giant Easter egg, this hardworking Easter Bunny got some help from his little friends. We all need some friends to help us sometimes. Just like your friends would rush to help you, these little chicks are here to help their Easter Bunny friend. 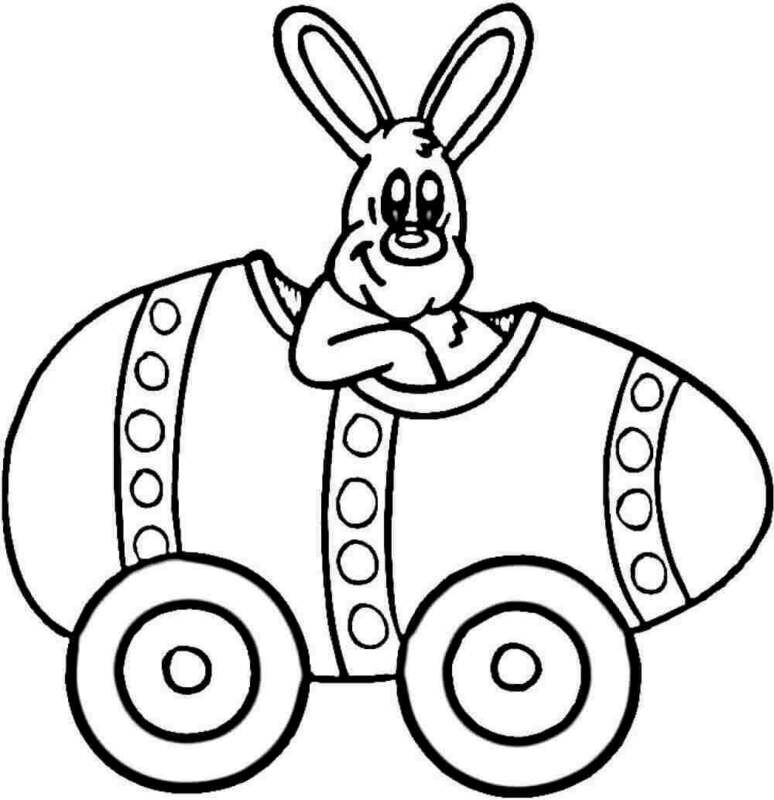 You can see the joy on the face of this lucky Easter Bunny who has been given the opportunity to ride a car made of an Easter egg. Wouldn’t you like to ride such a fun car? Maybe in the future, such cars will exist! But for now, take a quick printout of this coloring page and give this cool illustration some real colors. Looks like the fun of the imaginative car has passed on to this lovely Easter Bunnies couple. 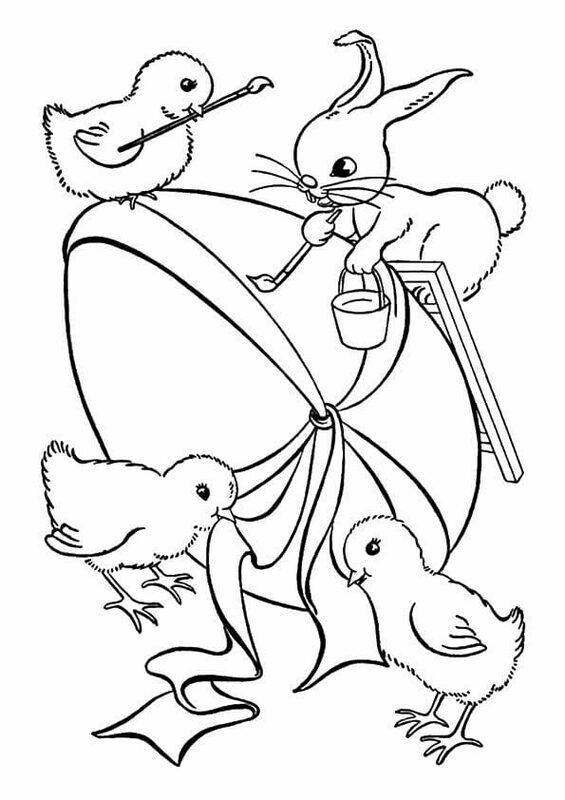 The Easter Bunny wife is so happy being pushed in a wheelbarrow by her husband, as she sits pretty on an Easter egg-inspired seat made by him. We love doing things for the ones we love. You must have seen your dad or your mom doing wonderful little things for each other too. 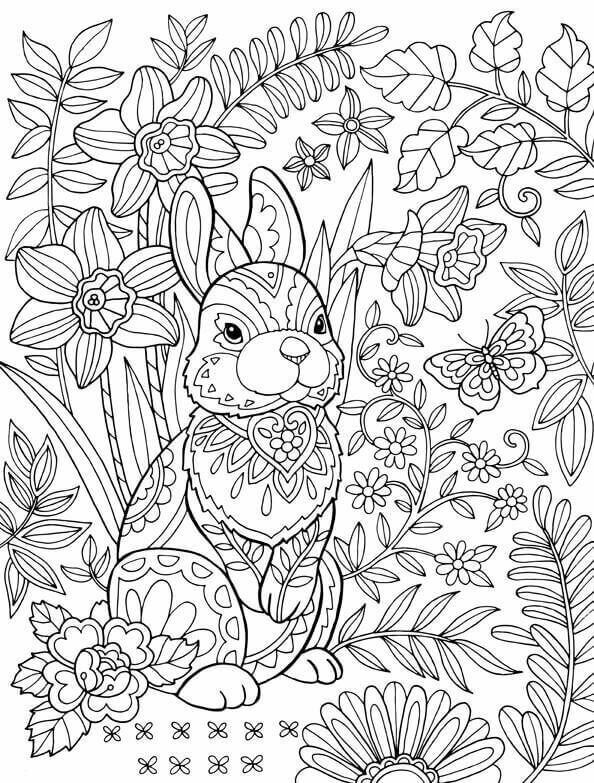 This Easter Bunny is hidden in the bushes without the colors to make him stand out from the leaves and flowers. You can help him differentiate from his surroundings by printing this page and coloring him in special colors while using different colors for the rest of the illustration. He is putting his trust in you. Work hard and make him happy. Trying to impress his elders with his hard work, this little Easter Bunny has decorated a lot of Easter eggs in brilliant designs and patterns. We love a hard working bunny, don’t we? You can reward this little fellow with some spectacular colors for this illustration. Taking hard work and discipline to another level is this meticulous Easter Bunny, who has come more than prepared for Easter. She knew that there will be lots of deserving good children in the world, so she made two Easter egg baskets in case there is a shortage. How thoughtful of her, isn’t it? Making sure they do not break or damage this giant Easter egg these two clever Easter bunnies are carrying the egg in a wheelbarrow. They are almost there at the home of a deserving child. 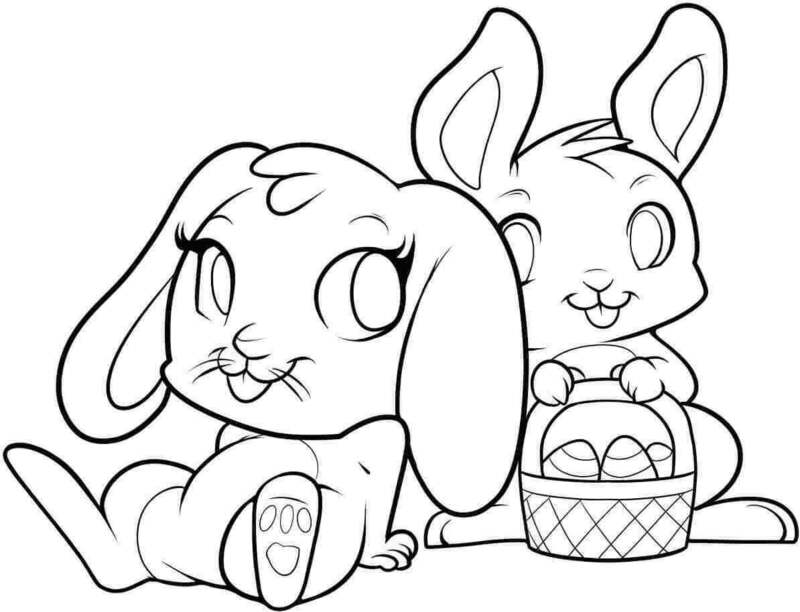 You can watch over them and bring excitement to the illustration by printing and coloring this page. Sometimes flowers are the best thing to decorate something. Looking at flowers can make us smile out of joy. That must be the reason this cutely dressed Easter Bunny in a bow-tie has painted some flowers on this “Happy Easter” wishes for you. You can thank her for her wishes by adding colors to the flowers and the rest of the illustration. 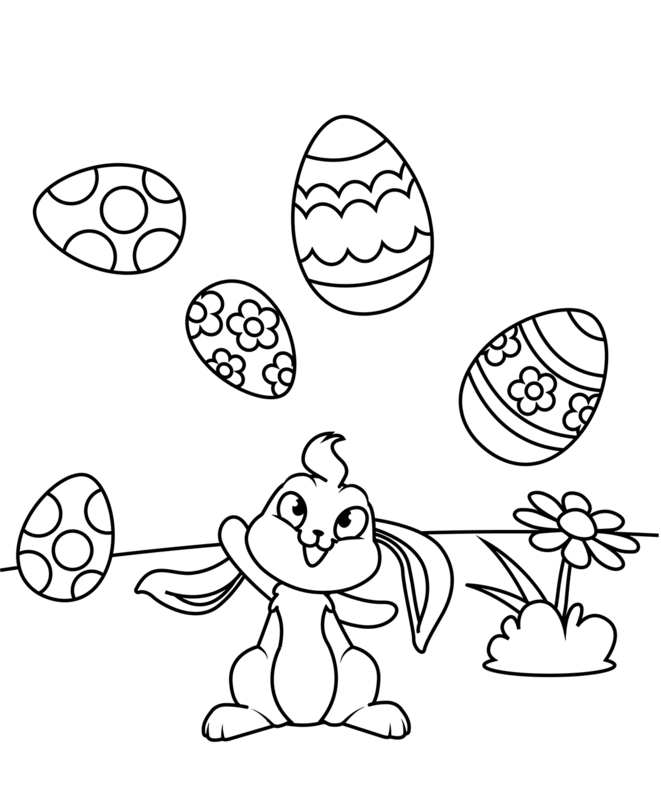 This Easter Bunny is prone to day-dreaming, thinking about a huge Easter egg that is beautifully painted and decorated. He will need to get working if he wants to turn this dream into a reality. Unlike him, always believe in doing things rather than just dreaming about it. Quality is non-negotiable and an uncompromising aspect of Easter egg decoration and painting competitions which are some of the fun activities held on Easter. Does he look super strict like your Math teacher? You better make sure when you print and color this page, you do it with utmost care. This Easter Bunny was so hungry that he started eating all his carrots. When it was time to wish everybody, he did so with a carrot in between his teeth. Your parents would have told him to not speak with food in mouth, right? Just like the way they tell you when you start talking while still eating your food. This Easter Bunny is here with all his preparation done for Easter. 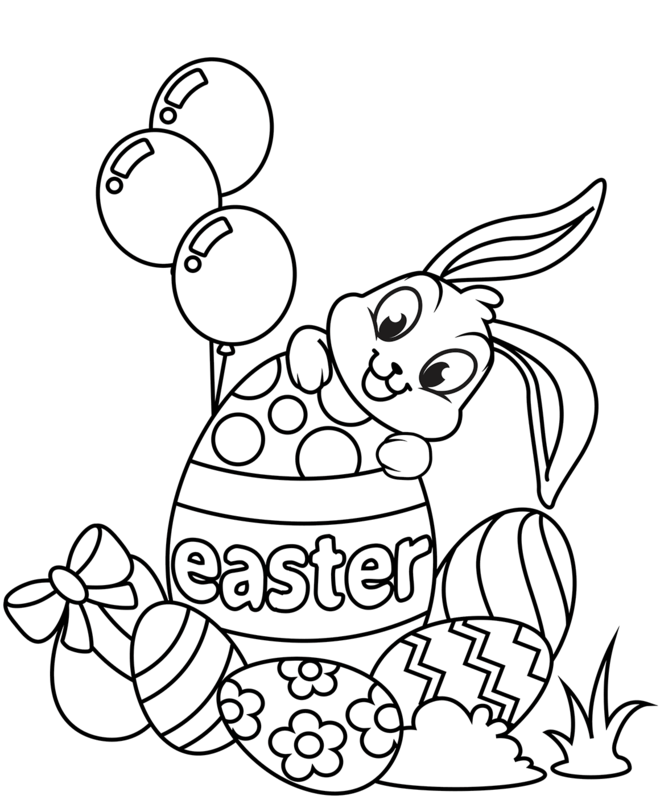 From well-decorated giant Easter egg to a variety of painted normal-sized eggs, this industrious Easter Bunny even got some colorful balloons for all the fans. 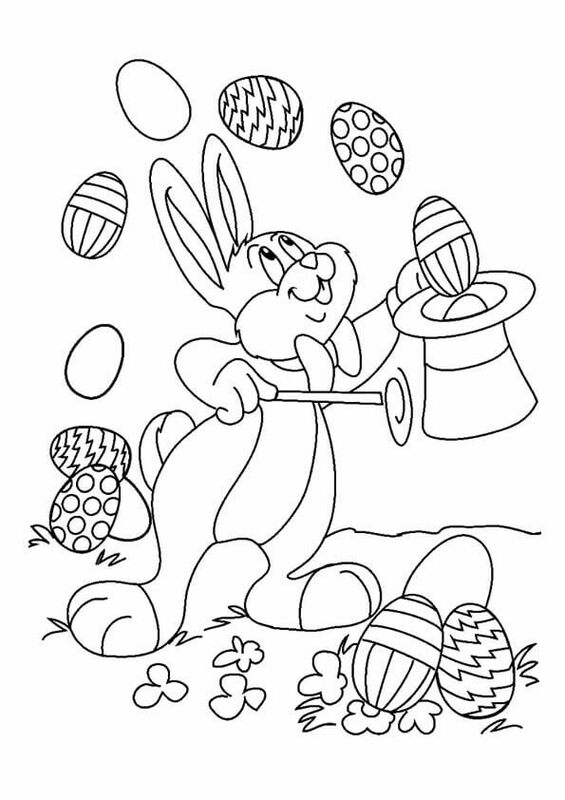 Self-assured of his talent, this charming Easter Bunny is taking a risk juggling all his Easter eggs with one hand only. Look at that one Easter egg that is falling to the ground. He hasn’t noticed it yet. There is a thin line between confidence and over-confidence. Unlike him, be sure you stay humble while still being confident. These two Easter Bunnies take their work seriously. Even if it means transporting these giant Easter eggs to children living in remote and inaccessible parts of the world. There is no substitute for hard work. If you have a responsibility, you should always follow it professionally. You can learn from them and carefully color this page. Even the tiniest members of the Easter Bunnies have contributed to the decoration and preparation of the Easter eggs. Any contribution, however small, can make a lot of difference. 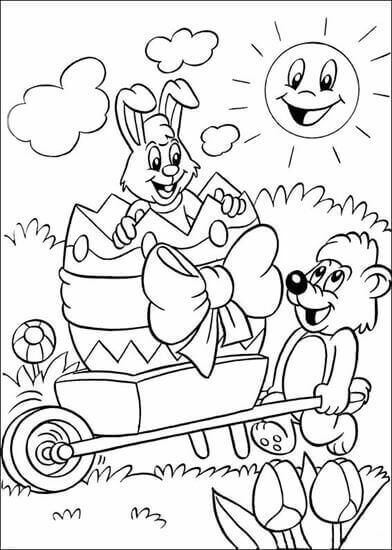 You can appreciate their hard work by printing and coloring this page in joyful colors. This Easter Bunny is finding it hard to understand why his load of Easter eggs feels heavier than when it was kept on the ground. He doesn’t know that when he turned around to put the load on his back, this naughty little chick jumped on to the basket. Have fun putting mischievous colors to this illustration. Once a magician’s assistant, this Easter Bunny is working magic with his hat, bringing out one decorated Easter egg after another. He has already managed to collect a decent amount with this bunny magic. You can work your magic too on this illustration with your coloring skills. These two little Easter Bunnies have underestimated the weight of this giant Easter egg. But they are not giving up. They are giving their best to make sure the egg doesn’t break, and they succeed in transferring it to the Easter egg basket. Print this page and thrillingly color this suspenseful illustration. The two little Easter Bunnies were inspired by their ancestors like this old Easter Bunny who walked a long while to deliver the Easter eggs to a rewarding child. As there was no technological advancement then, he had to walk a lot. Always be appreciative of the past and the older people in your life who worked hard to give you a comfortable life. Gratitude is an enriching quality to have. 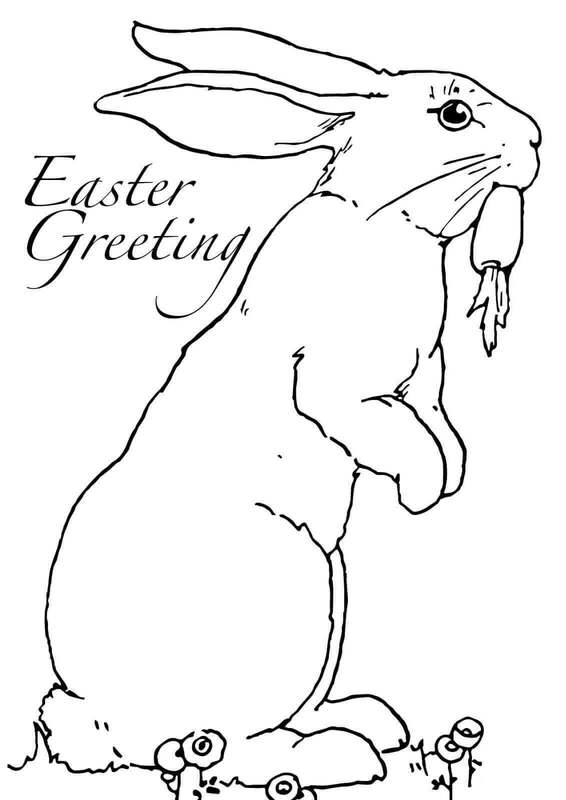 Here’s a perfect poster to put up in your house so that the Easter Bunnies feel welcomed when they visit your place. Simply print this page and fill it with attractive colors. Once done you can paste it or hang it to show your anticipation for their arrival. 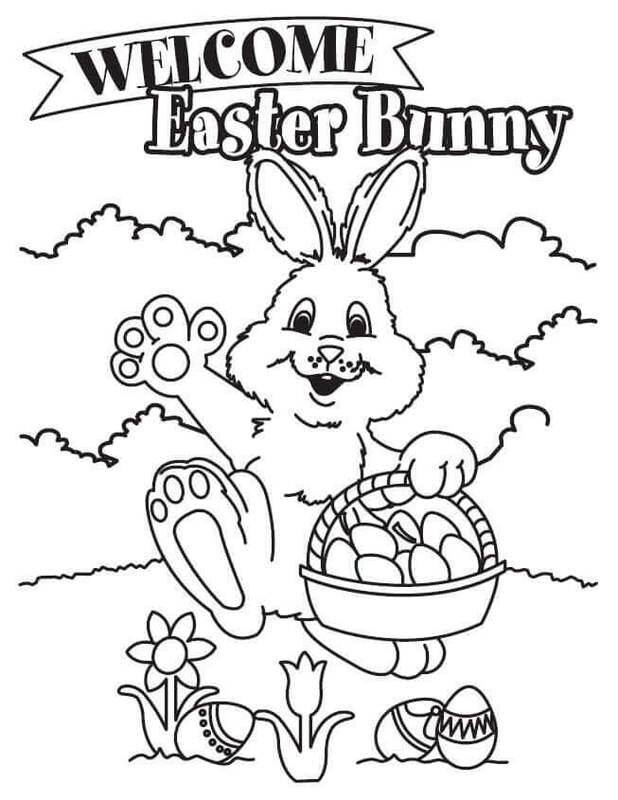 Somehow, on that welcoming note, we have reached the end of today’s collection of Easter Bunny coloring pages printable. You should now be able to tell your family and friends about the fun-loving and hard-working Easter Bunnies if they want to know about them. Knowledge, like helping and caring, is a great thing to share.